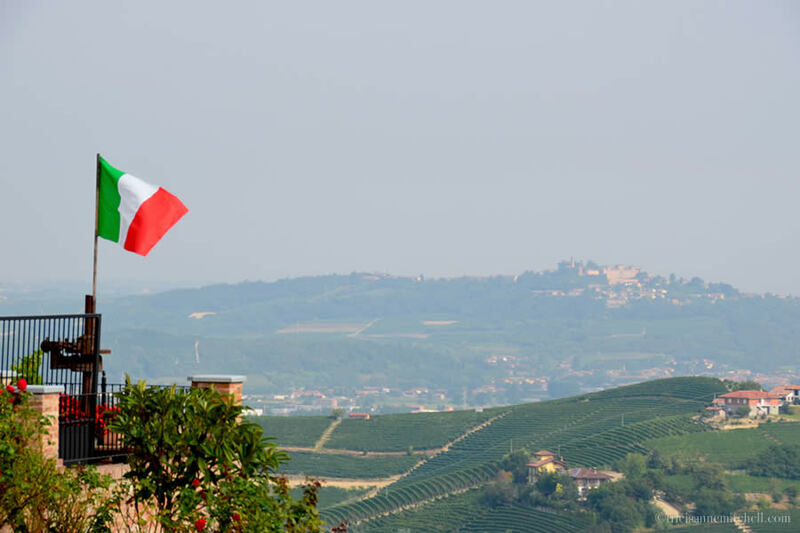 Barolo and Barbaresco are the wines most famously produced in the Langhe. Both of these powerhouse reds are made with the Nebbiolo grape. However, despite that commonality, the wines have distinctly-different personalities and manners of production. Barolo wine, for example, must spend two years in barrels and an additional year aging in the bottle, whereas Barbaresco must only spend one year in the barrel and one year in the bottle. While Barbaresco wine can generally be enjoyed when it’s younger, it doesn’t tend to age as well as Barolo does. Barbaresco is also said to be lighter, and more feminine. Surrounded by a sea of vineyards resembling a natural amphitheater, the family-owned Montaribaldi Winery greets visitors with wooden barrels brimming with red begonias, a children’s playground, and a table shaded by a grapevine-covered pagoda. Inside, we’d meet Antonella Rivetti, the daughter-in-law of Montaribaldi’s founders, Pino and Carla Taliano. 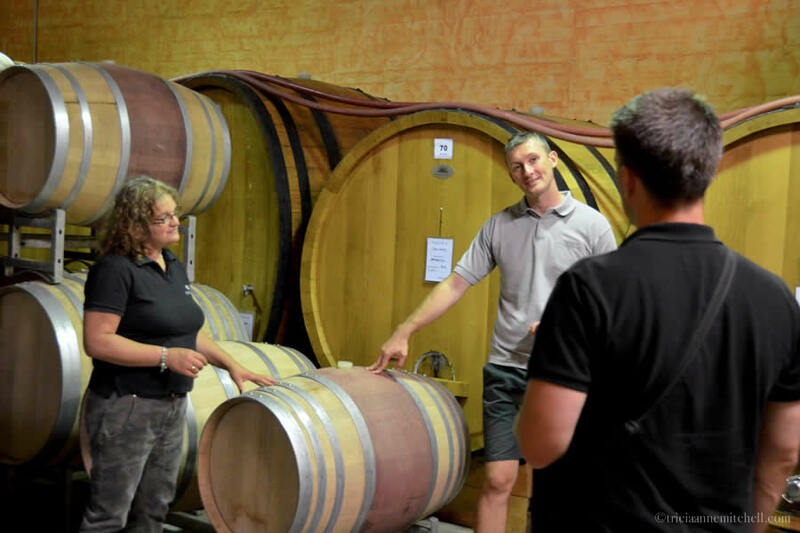 On a tour that would take us through the fermentation room and cellar, Antonella and Marco walked us through the basics of what Montaribaldi does. 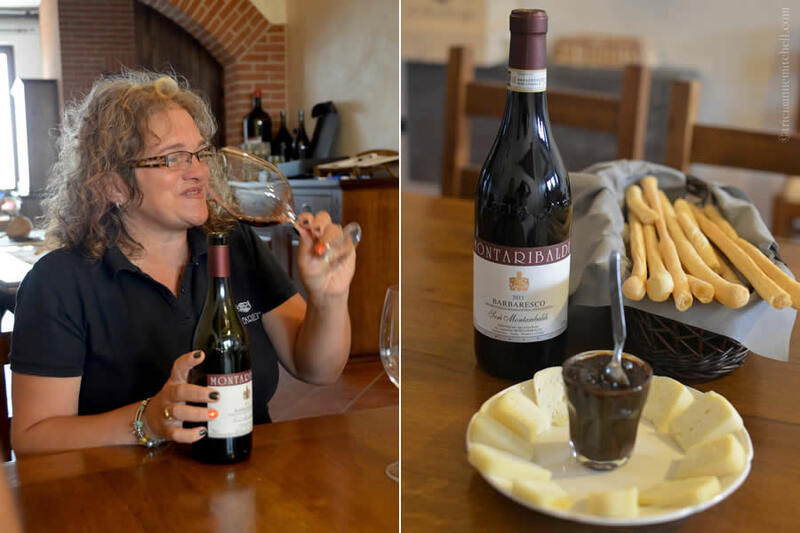 “Barbaresco wine is the queen while Barolo is the king,”Antonella said, with a smile, while pointing to a bust likeness of the so-called ‘father of Barbaresco,’ Domizio Cavazza. “At first, Barbaresco was the poor brother of Barolo, but it got recognition thanks to Cavazza’s help,” she added. Cavazza, it turns out, was a gifted agronomist, who not only established a winemaking school in nearby Alba, but who also co-founded a cooperative that produced the first Barbaresco wine in 1894. 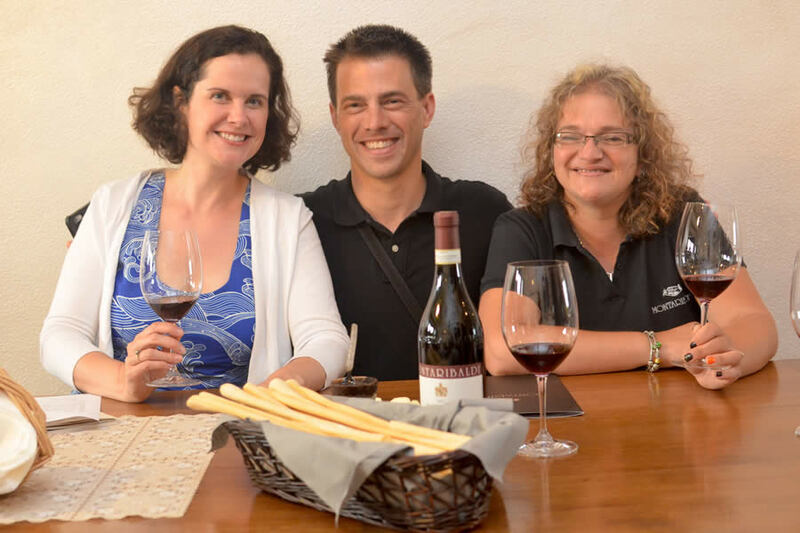 Like Barbaresco’s founder before them, the Montaribaldi Winery family is also involved in their community. When the winery commemorated its 20th anniversary last year, the team decided to donate money to a charity benefitting children with special needs rather than have a lavish party. As for its winemaking philosophy, Montaribaldi is not yet certified organic, but the winery is moving in that direction. 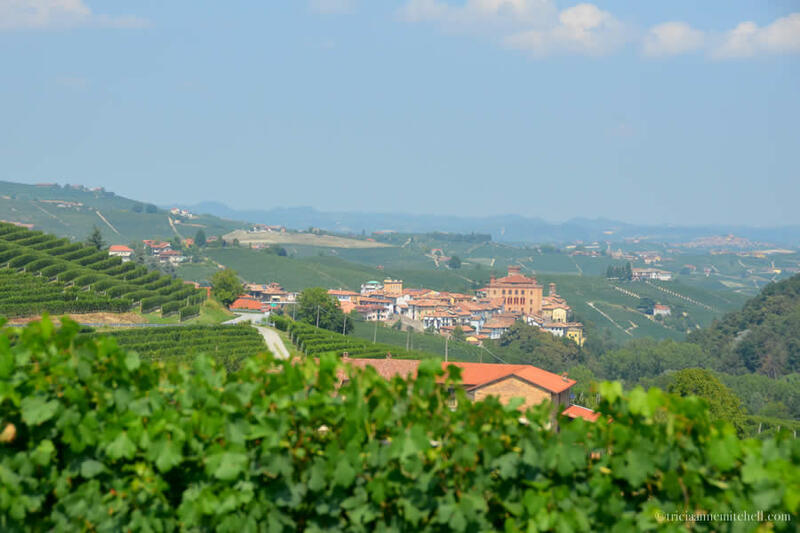 Unlike Monferrato wine country, which we’d visited the day before, Antonella explained that Montaribaldi doesn’t remove the grass that grows around the base of their grapevines. Tempting grapes, nearing harvest time. 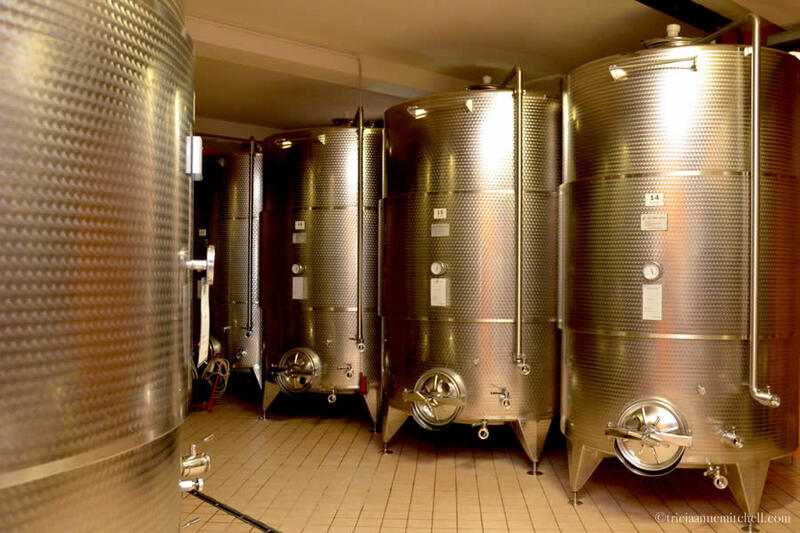 Montaribaldi produces about 150,000 bottles of wine per year. Most of Montaribaldi’s vines were planted in 1968. Asking our host, Antonella, if we could snap a shot of the bottles of wine which we enjoyed, she decided to go even further – setting out Montaribaldi’s entire display of 18 types of wine and 3 grappas. This montage turned out to be popular with other wine tasters too, each waiting to ham it up behind the spectrum of bottles. I’m laughing here because Antonella joked that the grappa I’m holding is actually Chanel No. 5. 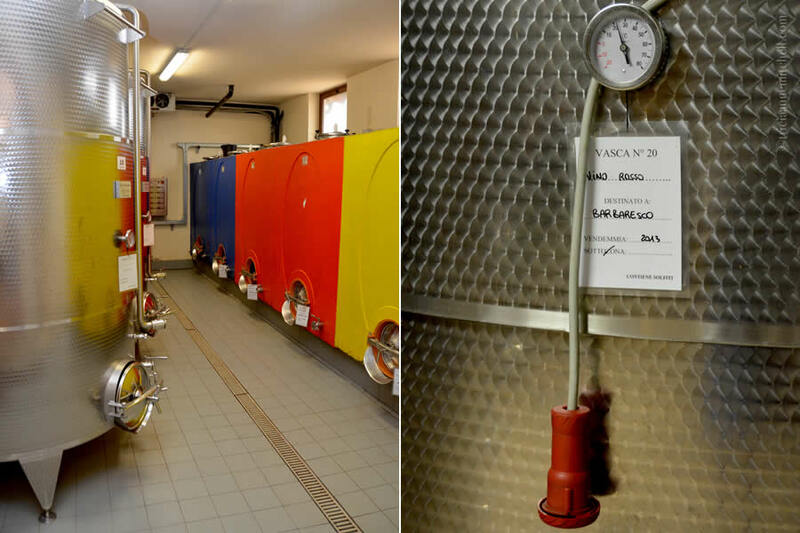 The photo on the left showcases how Montaribaldi’s fermentation tanks have evolved over the years. 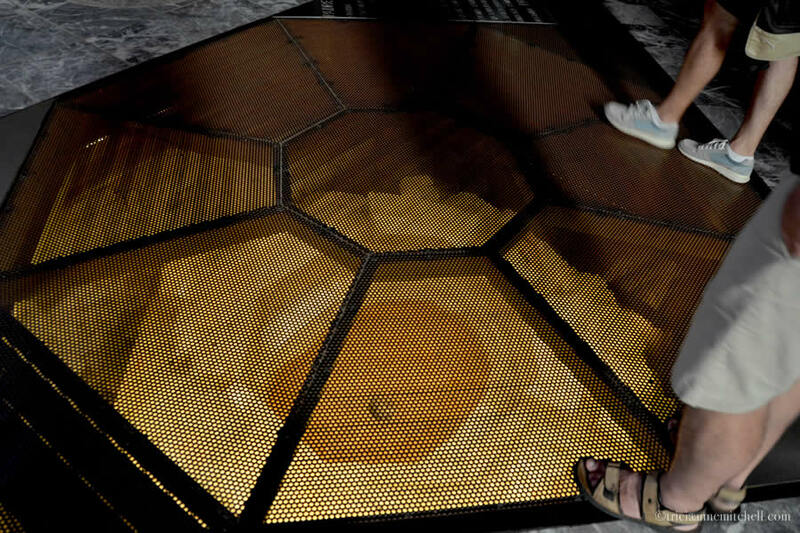 The colorful concrete ones were previously used, whereas now stainless steel is preferred. 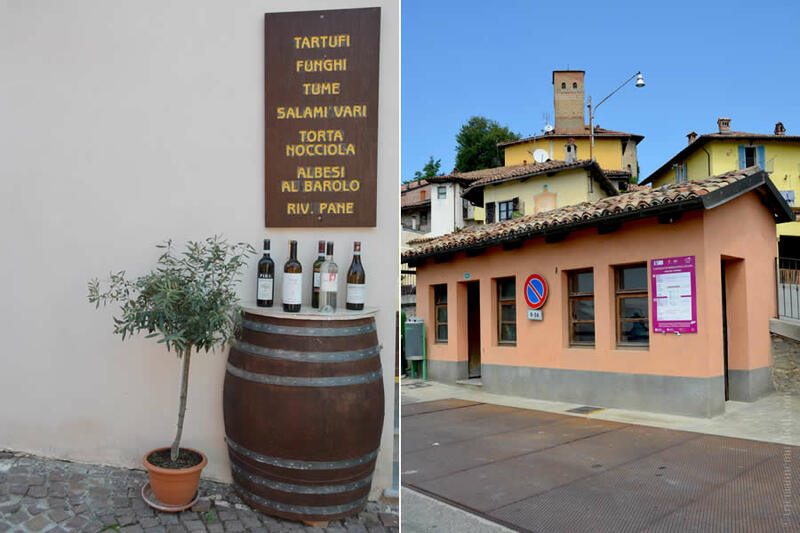 In the photo on the right, the tag indicates what type of wine it’s destined to become (Barbaresco) and the year the grapes were harvested (2013). 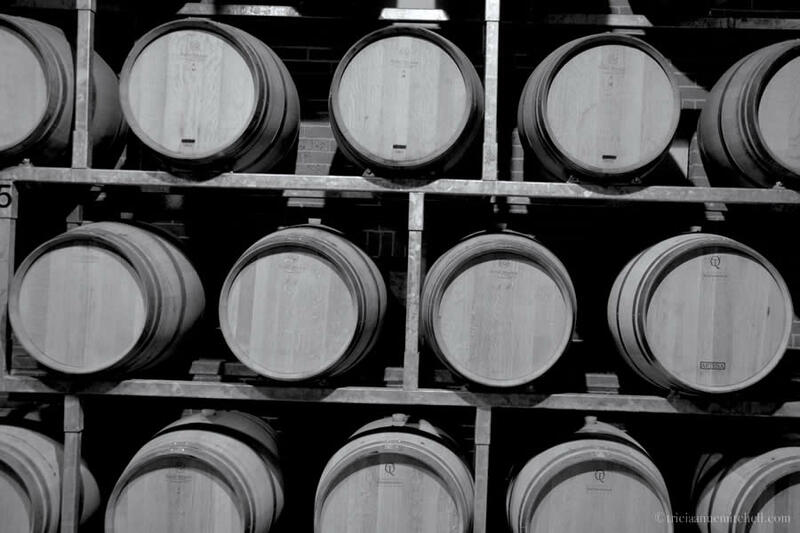 Once barrels have outlived their use for wine production, Montaribaldi will sell them to balsamic vinegar and grappa producers. Antonella (left) poured 3 samples of wine for us: 2 types of Barbaresco and 1 Barbera. As finger food (right), we were offered Grissini (traditional Piedmontese breadsticks), Tuma cheese (made with half cow milk, and half sheep milk), and a delightful jam called Cugnà. The jam was made with grape must, pears, apples, quince, and whole hazelnuts. 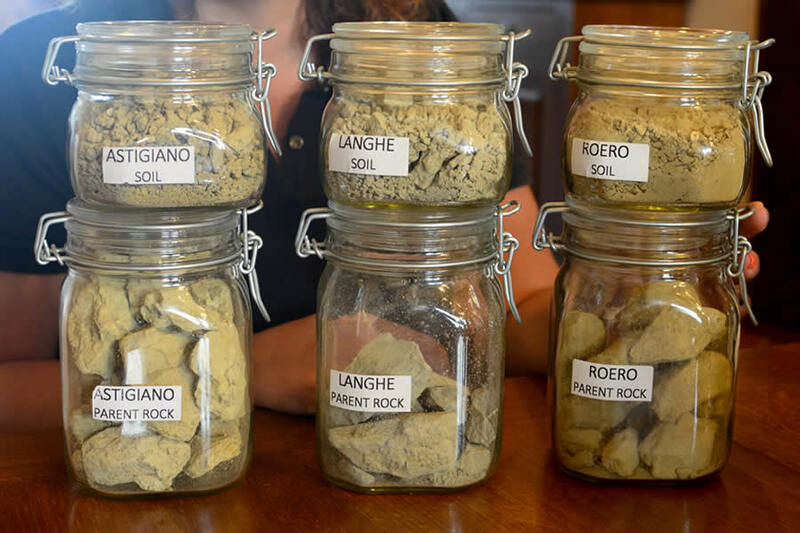 The varied soil of the Astigiano, Langhe, and Roero. 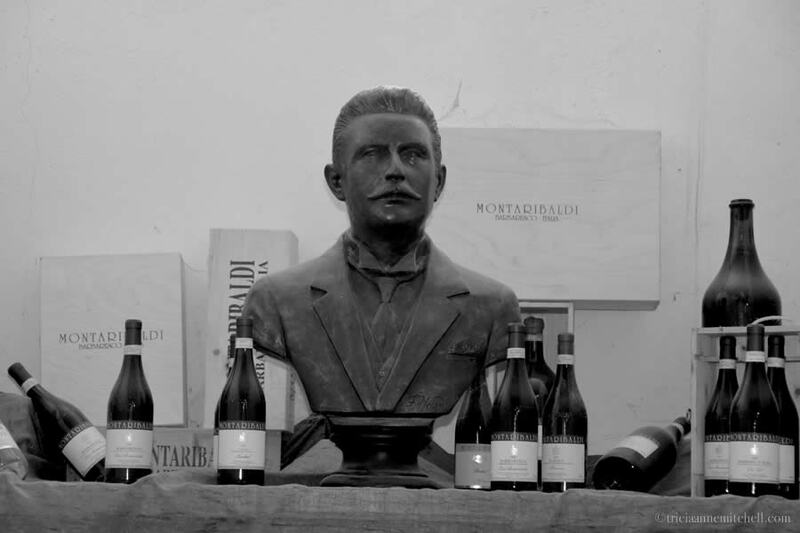 A bust of the father of Barbaresco, Domizio Cavazza. It was sculpted by Montaribaldi’s founder, out of clay. 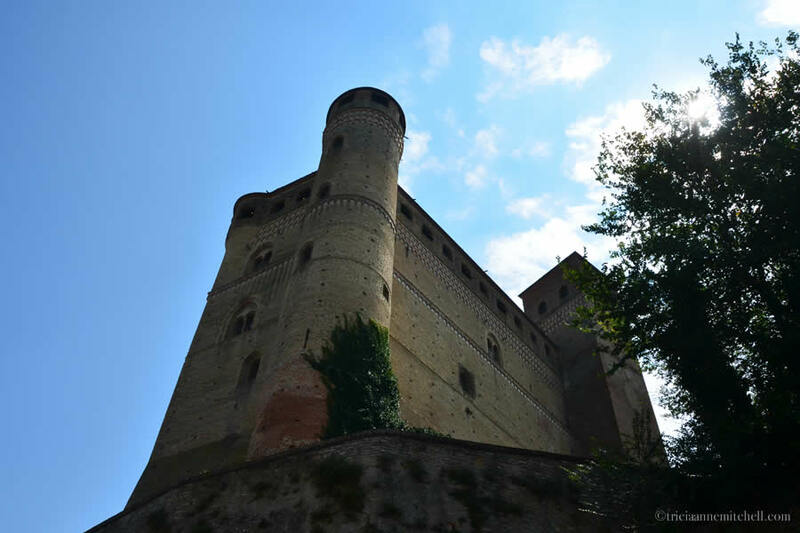 “The cities of Alba and Asti were enemies for centuries,” Marco said, as we took in extraordinary views of the Langhe-Roero countryside from the medieval Barbaresco Tower. 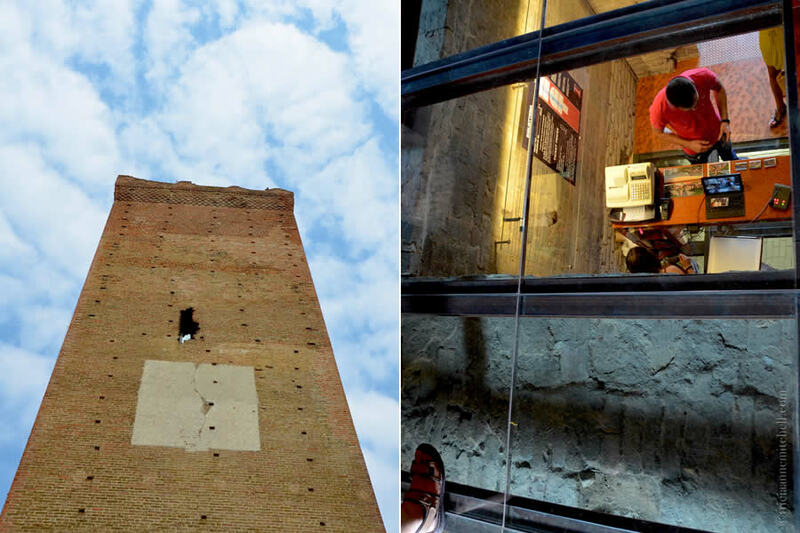 Barbaresco’s 30-meter-tall brick tower had only months earlier been opened to the public, however, it’s been around since medieval times — perhaps as far back as the 12th century. Today, Alba and Asti are no longer warring city-states, of course, but the two cities do maintain a friendly rivalry. For example, Alba annually holds a donkey Palio race that pokes fun at Asti’s much-revered horse race. The latter event dates back centuries. 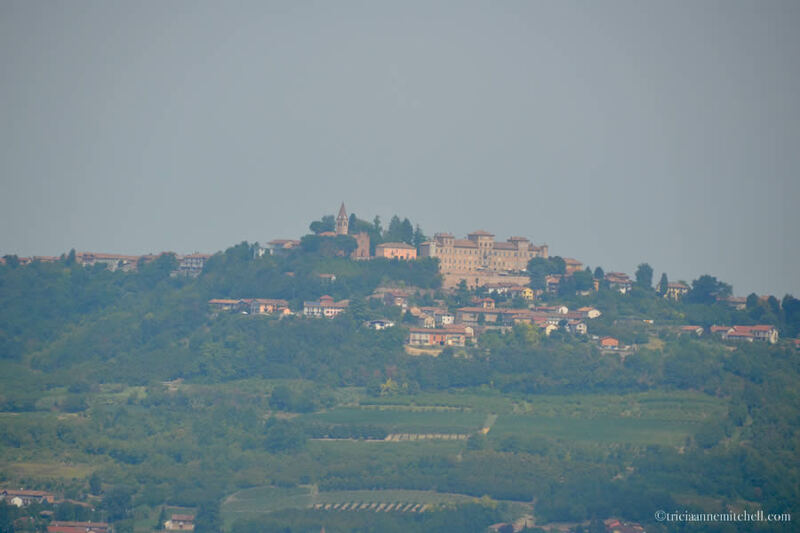 From the Barbaresco Tower, we had gorgeous views of the surrounding wine country. 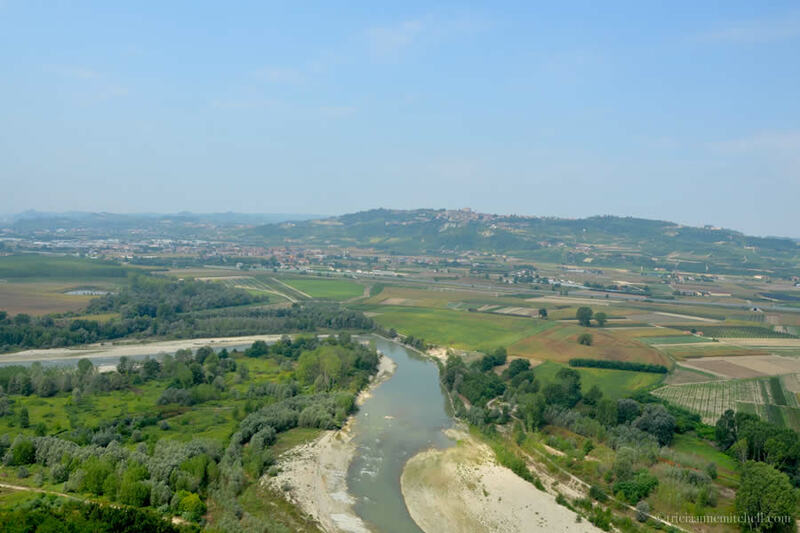 We could see the Tanaro River (which divides the Langhe and Roero districts). Off in the distance we could also glimpse Alba. Unfortunately, a perpetual haze prevented us from seeing the majestic, snow-capped Alps that give the Piedmont region its name. 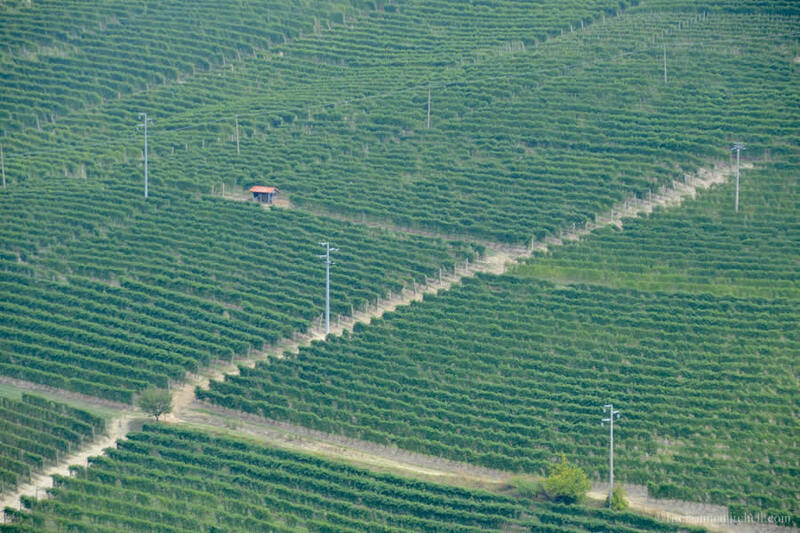 Piedmont literally means ‘at the foot of the mountain’. Once back on Barbaresco’s cobbled streets, Shawn, Marco, and I passed bicyclists enjoying an afternoon coffee at a café. We also spotted a church-turned-wine-shop and a man selling local products. I was delighted to make an edible purchase: a traditional Piemonte cake made of hazelnuts. 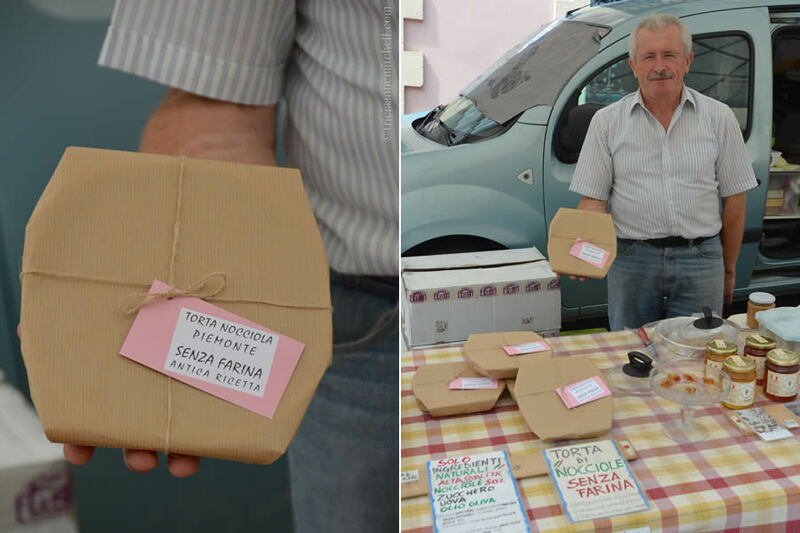 The Torta Nocciola Piemonte was simply wrapped in brown paper and tied with a twine-like rope. We brought the cake back to Germany, where we dressed it up for my father’s birthday. 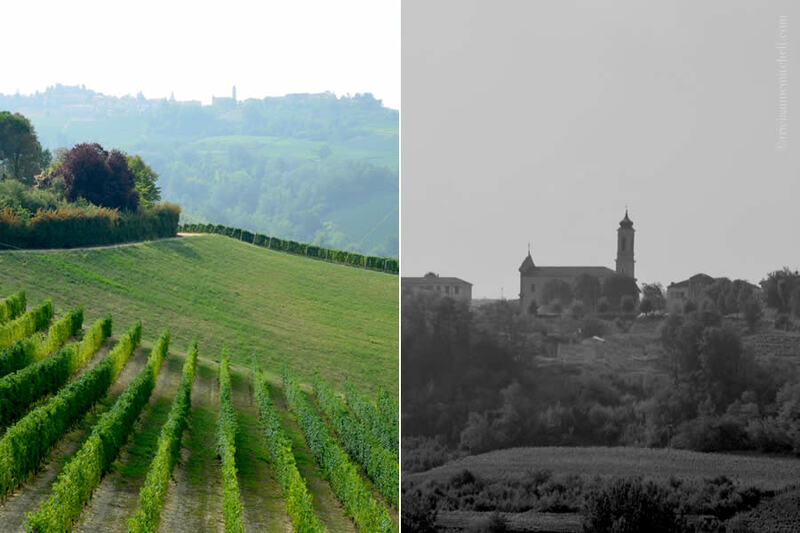 Barbaresco’s lookout tower (left) was recently renovated and opened to the public. Its interior (right) features an ‘old meets new’ style which I appreciate so much: transparent floors, and a glass elevator which transports visitors to its panoramic viewing deck, about 30 meters (98.5 feet) high. It’s believed that the tower was once part of a larger fortification complex. The Tanaro River snakes through the countryside. To the north of the Tanaro is the Roero, on the south side is the Langhe. 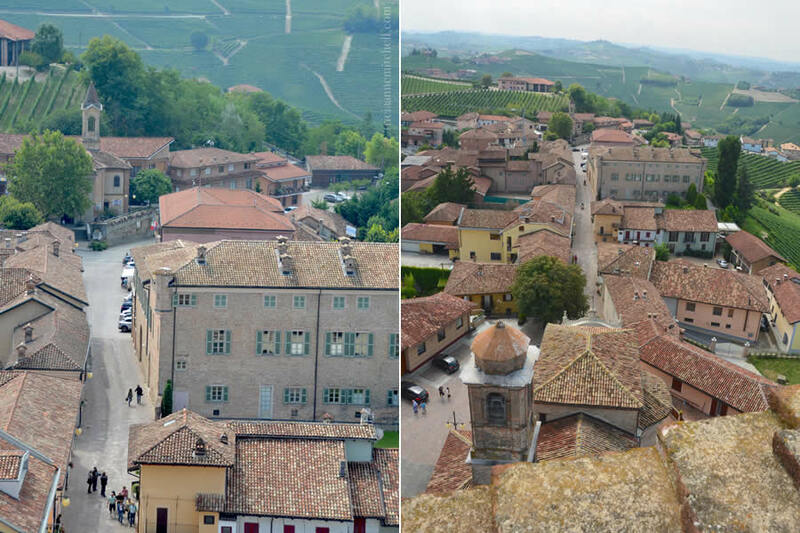 A bird’s eye view of Barbaresco, which has just over 600 residents. 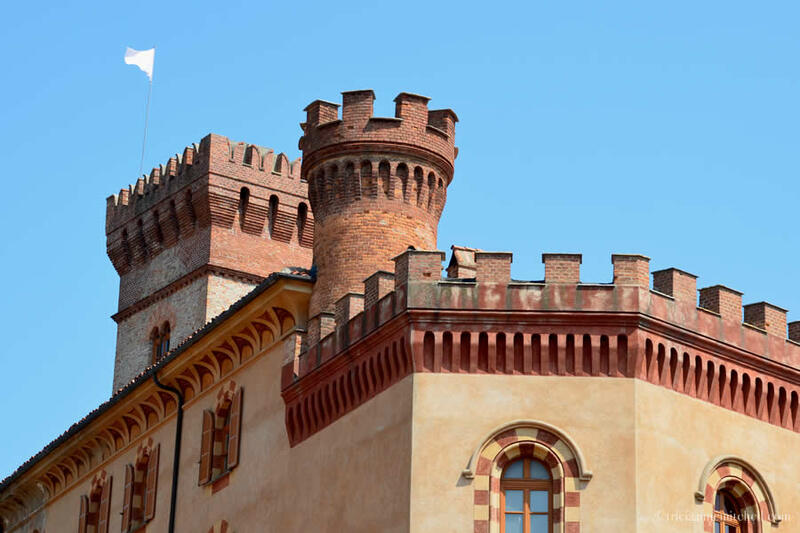 The tower offers splendid views for casual photographers, plus a great overview of Barbaresco wine country, for those wanting to survey the various viticultural areas. 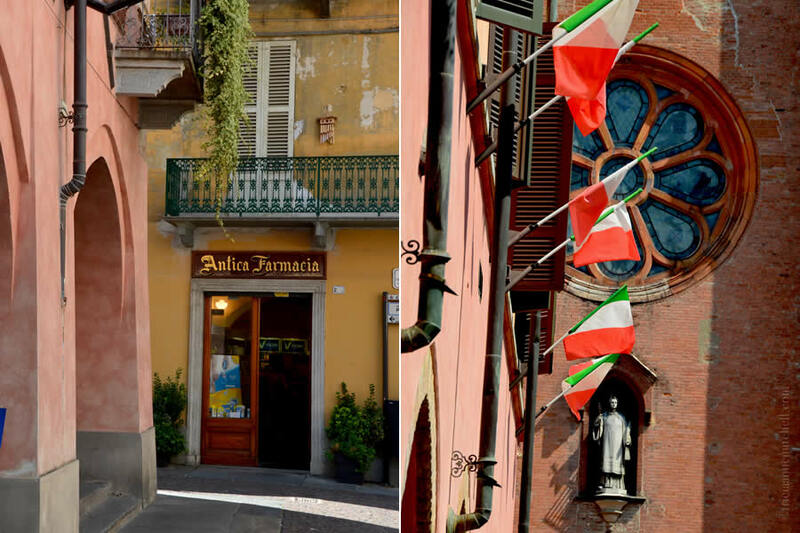 A man sells local Piedmont products on one of Barbaresco’s main streets (right). I bought this traditional hazelnut cake (left) and brought it back to Germany, where we enjoyed it for my father’s birthday. We added berries and dollops of cream. Its label notes that it was made “senza farina” or without flour. The ingredients included ground hazelnuts, olive oil, and sugar. It had a lovely nutty flavor and it was just sweet enough, but not overwhelmingly so. 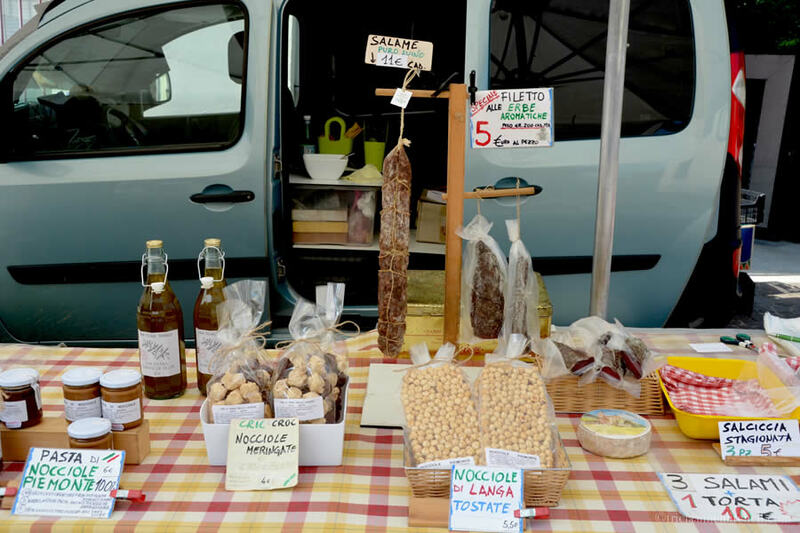 Other Piedmont goodies for sale included sausages, toasted hazelnuts, hazelnut meringue, and hazelnut spread. Barbaresco’s medieval tower (right) off in the distance. Motoring through the backroads of the Langhe, Shawn, Marco, and I embarked on a discussion of Italian misconceptions. Marco was passionate about the topic. Marco then asked me what international chain I hadn’t noticed in Italy. Shawn and I rarely frequent fast-food chains, so Marco caught me without a response. Our mini misconception lesson complete, we’d arrived in Serralunga d’Alba. The town’s nucleus is its fortress, from which businesses and homes spiral out in a snail-like pattern. Unlike Alba and Barolo, which seem to be more on the tourist radar, Serralunga d’Alba was rather quiet. A female resident read a newspaper on a bench, laundry hung from upstairs balconies, and we passed empty streets. No doubt, much of the town’s residents were enjoying the afternoon siesta or riposo. After our wine tasting, and the day’s whirlwind four cities’ tour, I felt as though I could join them in that endeavor! 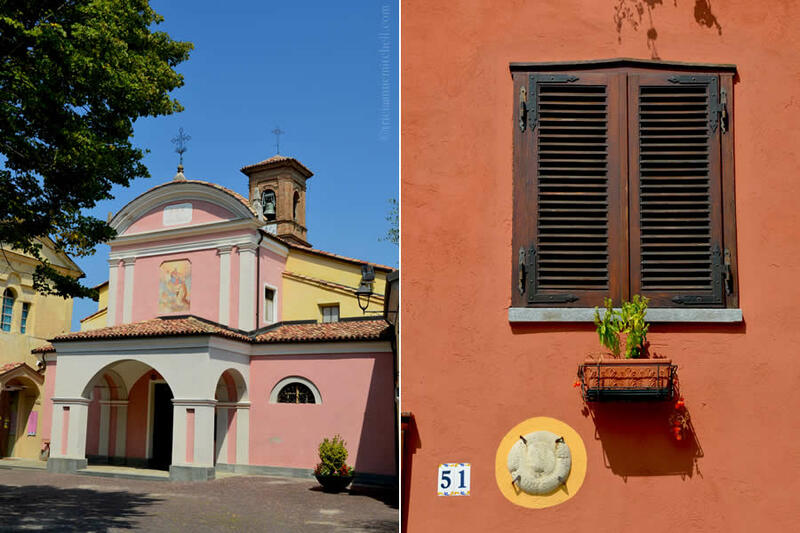 The town of Serralunga d’Alba is shaped like snail. A castle in the center was built for defensive purposes, and the rest of the town’s streets spiral out from that point. A shop selling truffles, mushrooms, salami, hazelnut cakes and more (left), and a grape weighing station (right). Traditionally, such weighing stations were present in most Piedmont towns. Trucks are weighed in the morning and in the afternoon, to determine the weight of grapes. The grapes’ weight, coupled with their sugar content, determine their selling price. 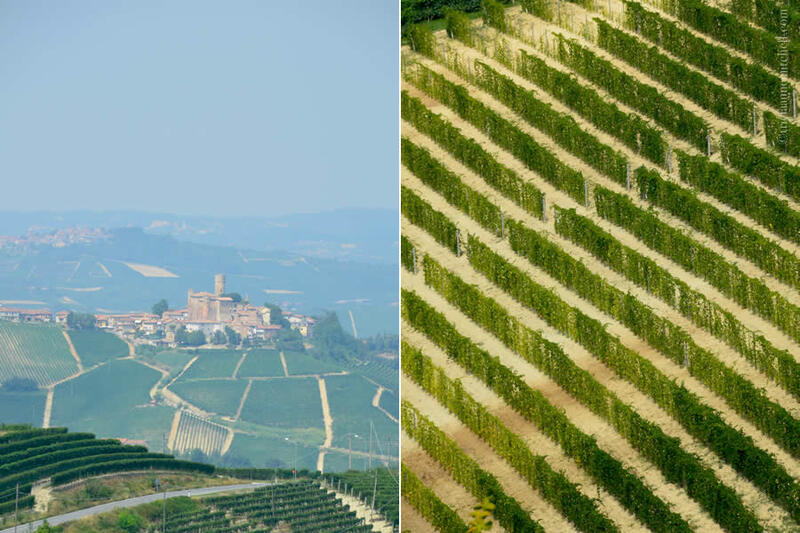 Serralunga d’Alba’s castle, majestically rising from a patchwork quilt-like field of vineyards (left). 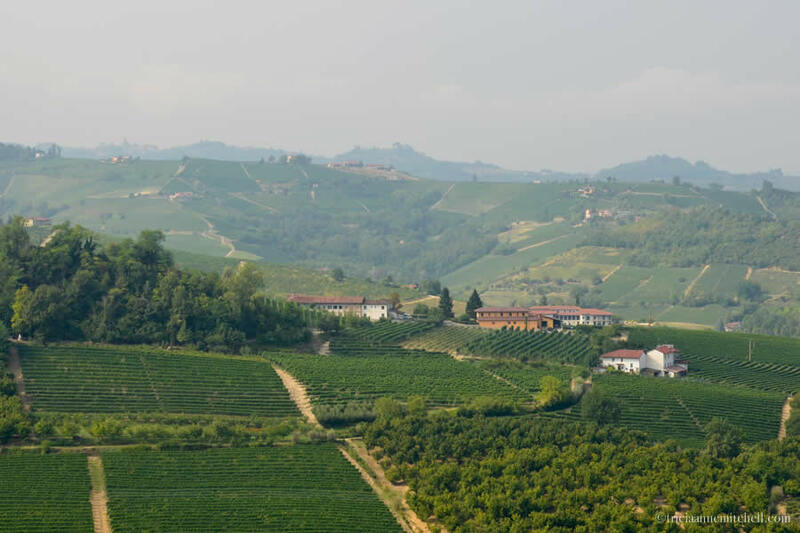 In the Barolo area, vineyards are much more plentiful than they were in the past. Marco told us that restrictions have been put in place to help prevent overdevelopment and landslides. 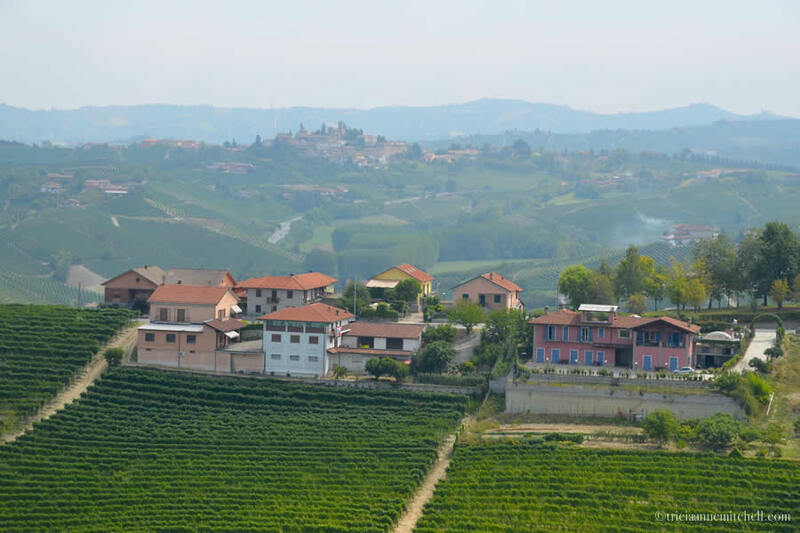 As we approached the world-famous town of Barolo, Marco mentioned that Barolo wine had actually been fine-tuned by a French woman named Juliette Colbert, from Bordeaux. Juliette married the prominent Marquis of Barolo, Carlo Tancredi Falletti, in the early 19th century. 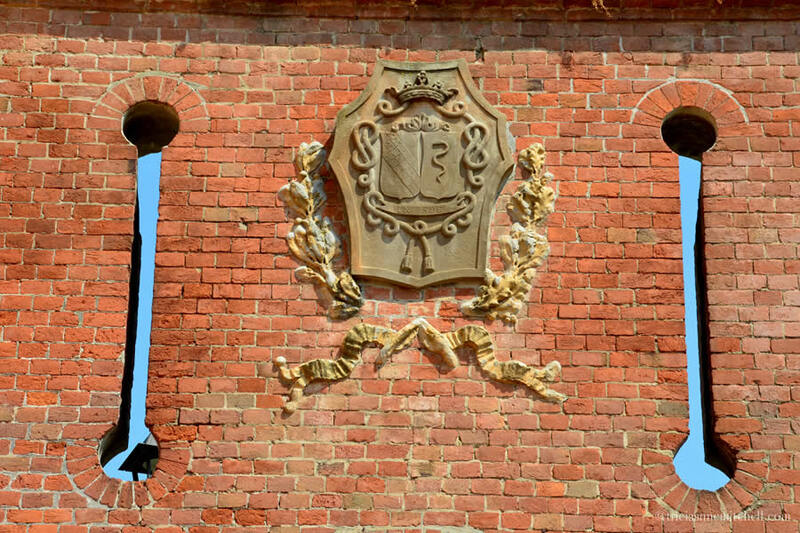 The pair’s coat of arms is still visible on Barolo’s castle. Today it houses a wine museum. 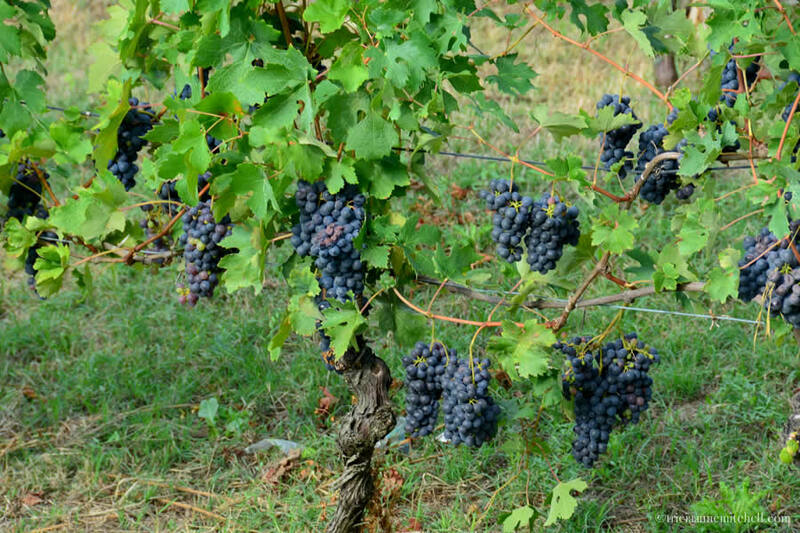 Juliette is said to have implemented Bordeaux-style wine-growing techniques in Piedmont. In addition to her oenological know-how, Juliette is also remembered for advancing various women’s and children’s causes. She also established a foundation for women and children that still exists today. The Barolo Castle houses a wine museum. 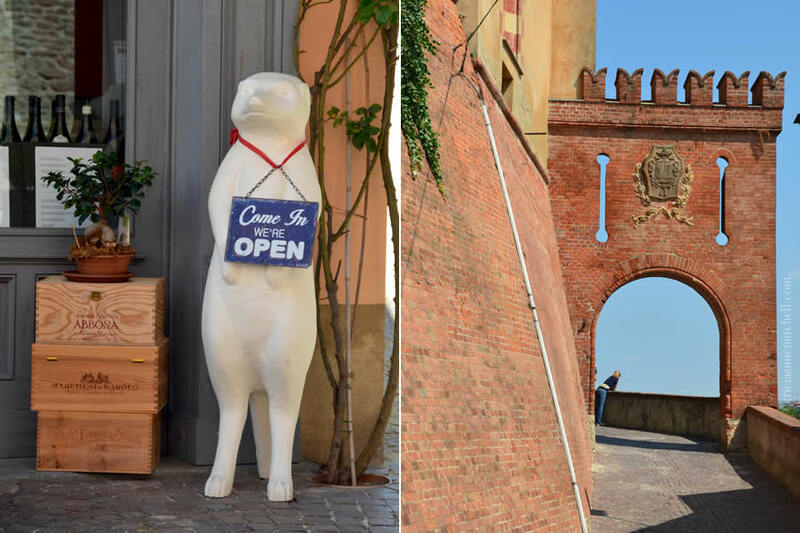 Barolo is replete with quirky animal figurines of all species and colors (left). On the right, an archway of the Barolo Castle. 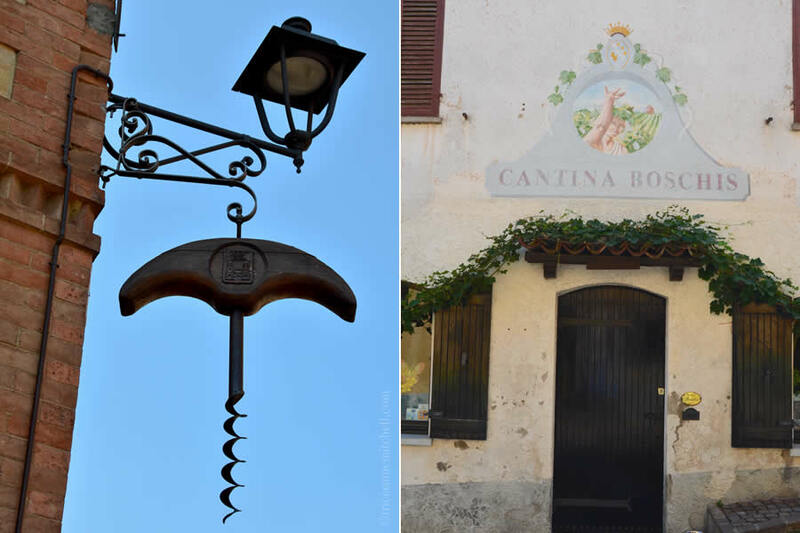 Barolo’s Corkscrew Museum, or Museo dei Cavatappi (left) and a wineshop (right). 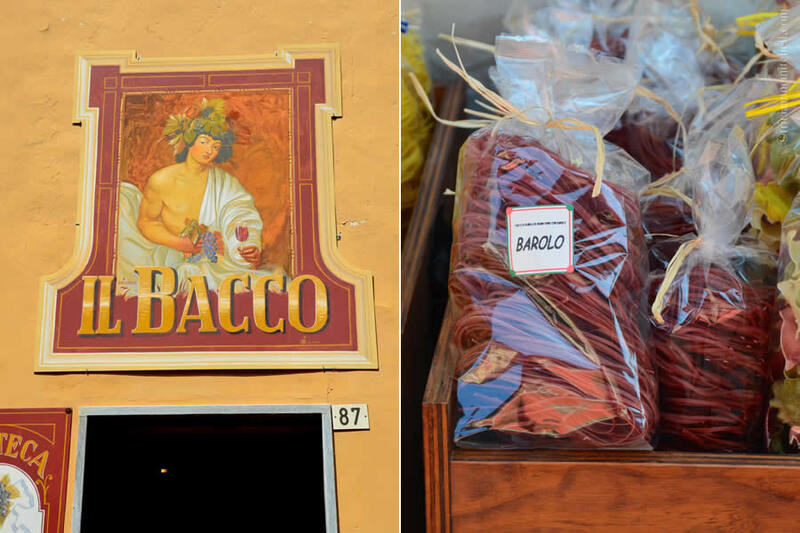 Colorful dried pasta infused with Barolo wine (right). Though we witnessed a mock truffle hunt the day before in Monferrato, we would miss Alba’s famed White Truffle Fair by just a few weeks. There, prized fungi can fetch thousands of euros per kilo! 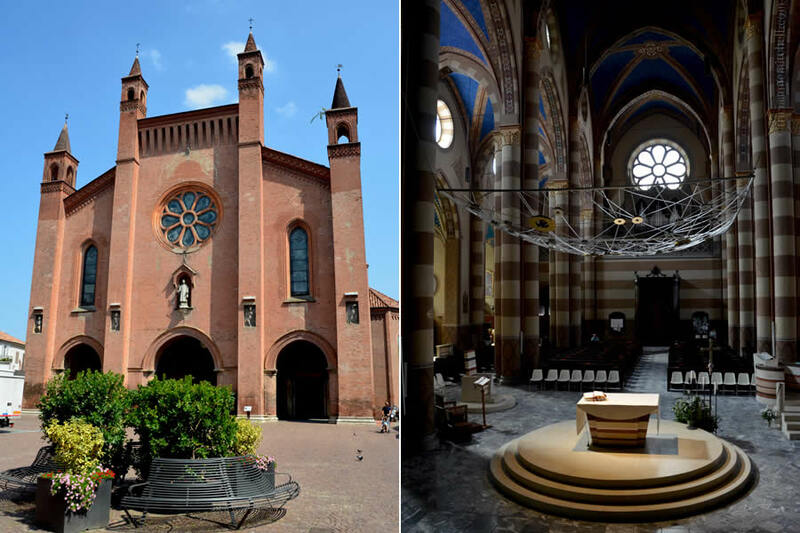 We would see other fixtures for which this capital city of the Langhe is known, mainly the Ferrero Chocolate Factory, and Alba’s elegant Neo-Gothic cathedral. We found it interesting to hear how the cathedral’s interior had evolved. Marco explained that the priest originally had his back turned to the congregation. Later, an evolving philosophy dictated that he face the attendees and be closer to them. This more recent evolution resulted in a new chandelier and altar being constructed. The light fixture is ultra-modern, and apparently stirred up quite a controversy when it was installed. 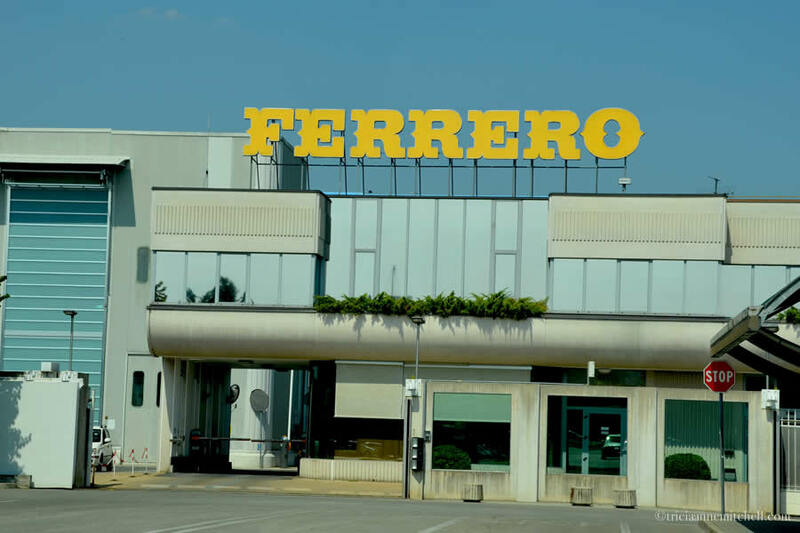 “The soul of Alba” as described by Marco, the Ferrero factory employs thousands, and makes popular sweet treats such as Nutella, Ferrero Rocher, and Mon Chéri chocolates. It’s not possible to tour the factory. Italian flags dance in the breeze (right), framing a statue on the front of the Alba Cathedral. 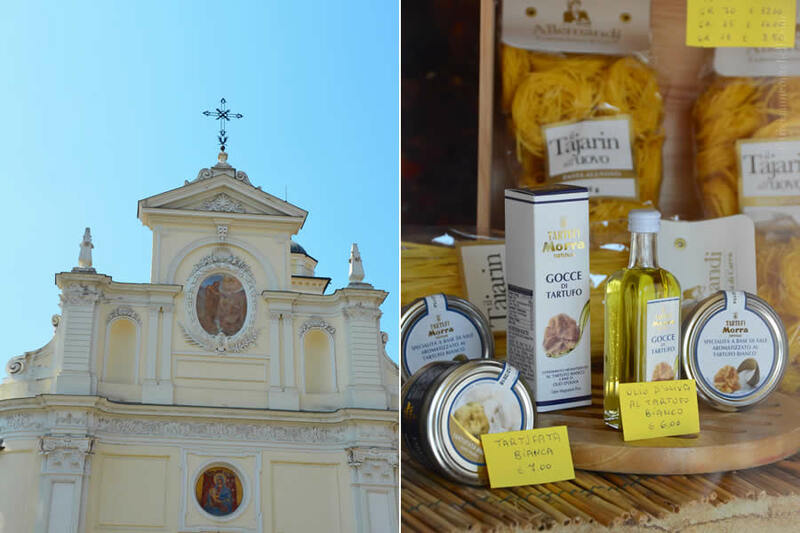 Alba is well-known for its annual White Truffle Fair, which is held every autumn. 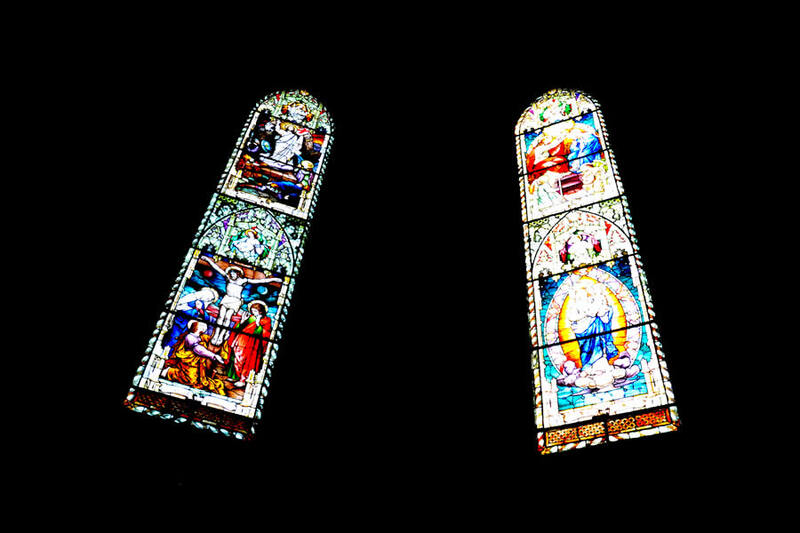 The Alba Cathedral exterior (left) features four sculptures, each representing 4 saints, and animals who represent them. The animals’ Italian names create an acronym of ALBA. (A = angelo or angel; L = leone or lion; B = bollo or bull; and aquila or eagle.) On the right, the church’s interior and its ultra-modern chandelier. The Alba Cathedral was built in the early 12th century, but it is believed that the earliest structure there was actually constructed toward the end of the 5th century. As Marco explained so nicely, churches were built on the remnants of others, “like layers of lasagna.” Below these visitors’ feet, is an ancient baptismal font. It’s exposed in one of the church’s main aisles, and was discovered during recent restoration work. Alba’s impressive choir dates back to the early 16th century. It features inlaid, paper thin wood, which were painstakingly glued and pressed together to form vintage scenes. On the right is a marble figurine near the choir. 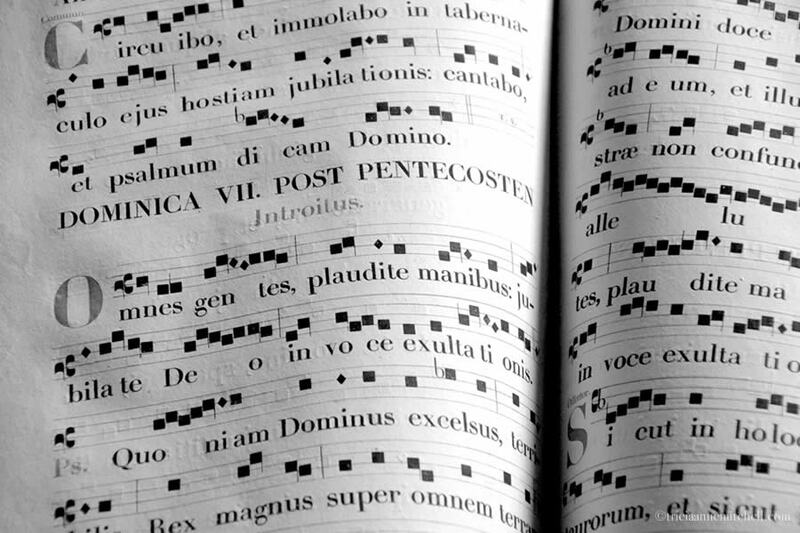 A choir book, in Latin. 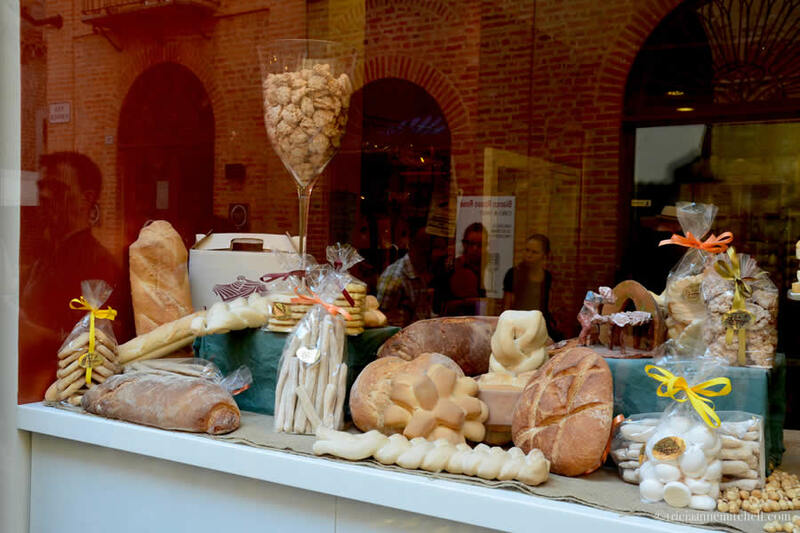 Truffle products for sale (right) in an Alba storefront. 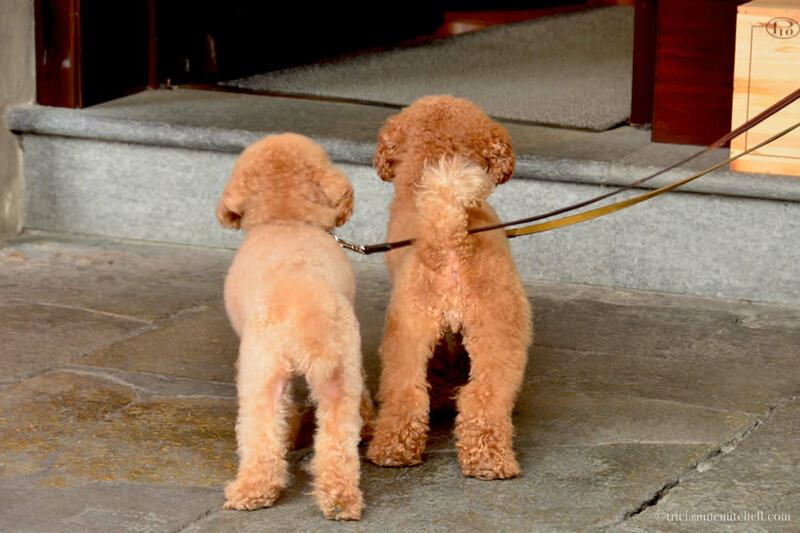 A poodle pair waits for their master to depart an enoteca (wine shop). Italy’s Piedmont (Piemonte) region is located about 140 km (85 miles) southwest of Milan. High-speed trains link the Piedmont area to Italian tourist meccas such as Rome and Venice. See Trenitalia for schedules and prices. While we found mass transit accessibility to be good in larger Italian cities like Asti and Turin, we were told that public transportation is quite limited in Piemonte’s countryside. Locals routinely advised us to rent a car or hire a private driver. Marco, one of Meet Piemonte‘s co-founders, coordinated the details of our visit in advance, and guided us through each excursion. 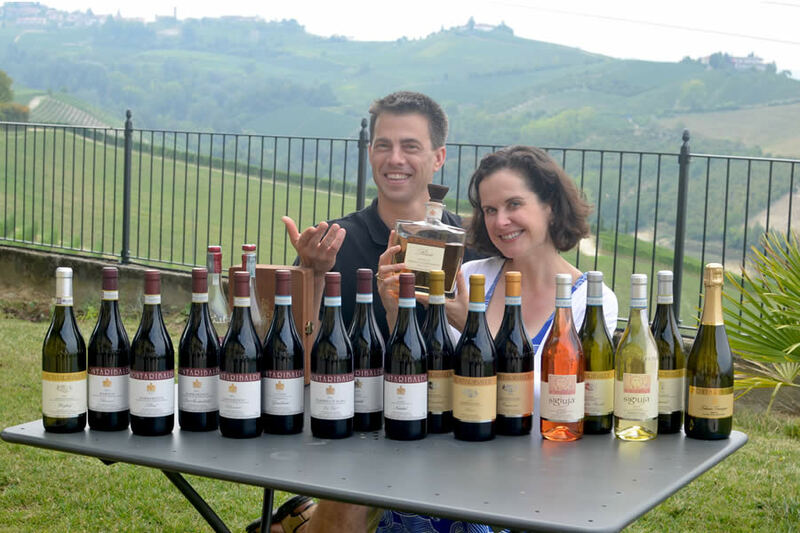 He and his colleagues lead customized tours covering everything from wine-tastings, to cooking classes, truffle hunts, hiking and biking excursions, and visits to Piedmont’s rice fields. Having worked in the tourism industry for more than a decade, Marco speaks fluent English and also helped ensure that tour partners took into account my gluten intolerance. Need more inspiration? This link contains an index of all my posts from Italy. Meet Piemonte hosted us during this day’s excursion. We’d like to say Mille grazie to Marco for being such a knowledgeable, patient, and enthusiastic host. Photography & text Tricia A. Mitchell. All Rights Reserved. Video footage is a creation of my husband, Shawn. such amazing journey, valuable information and educational. Thank you, Mihran! Indeed, we were lucky to embark on this adventure through Northern Italy. I’m pleased to hear that you found the details useful. Ah, now I need to go!!! 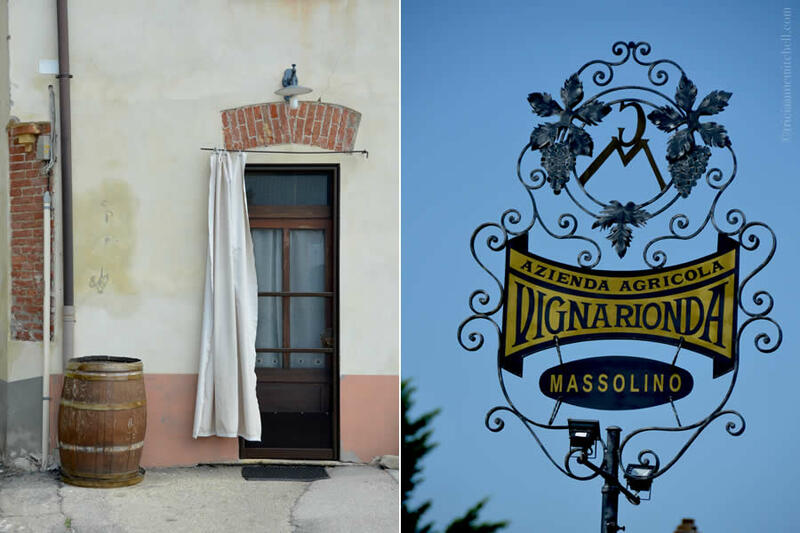 Fleming, glad to have helped put Piemonte on your travel radar. Have you been to other parts of Northern Italy? Not really! I studied abroad in Rome and have traveled extensively in central and southern Italy but not northern! It has a special place as it is my boyfriend’s maternal grandfather’s homeland! Love this post!! Have you been to Southern Italy? If so, please post!! Always love to see more! Having ancestral roots in a place can add such a nice depth to a visit, so it’s neat that your boyfriend’s family has ties to the northern part of the country. With the exception of short-weekend jaunts to Sardinia and Sicily, I can’t say that I’ve been farther south than Rome, though. We’re now living south of Sicily, in Malta, so we’re looking forward to exploring more of Southern Italy. Are there any spots you’d recommend from your travels, Fleming? What a gift for your children to be able to travel at a young age! Here’s hoping you and your family will someday soon be on a plane, headed to a slow-travel destination you’ve been yearning to see. As for me, I’d been to Turin for the Olympics, but had never explored the surrounding Piemonte countryside. 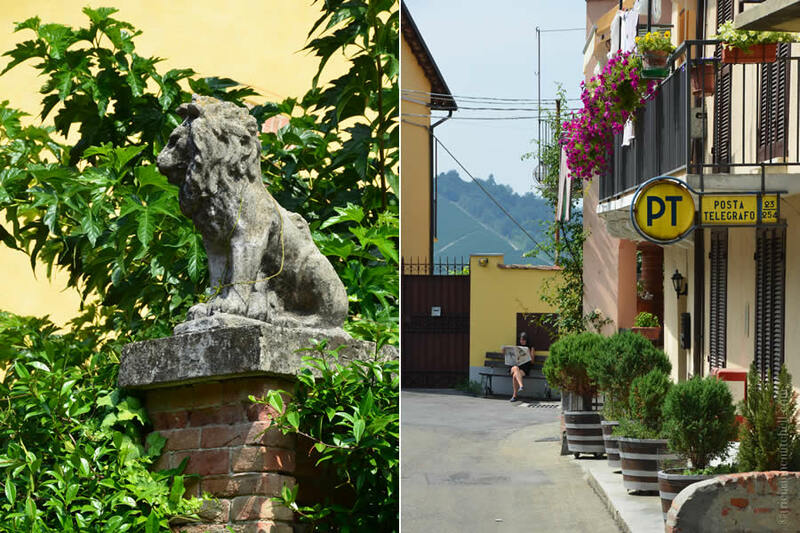 We missed Asti’s Palio horserace and White Truffle hunts by just a few weeks, but got just enough of a pleasant glimpse that we’re looking forward to return to Piemonte some autumn. Wish you a terrific Thursday! Thank you, Tricia! We were fortunate enough to catch one of the trials for Siena’s Palio. 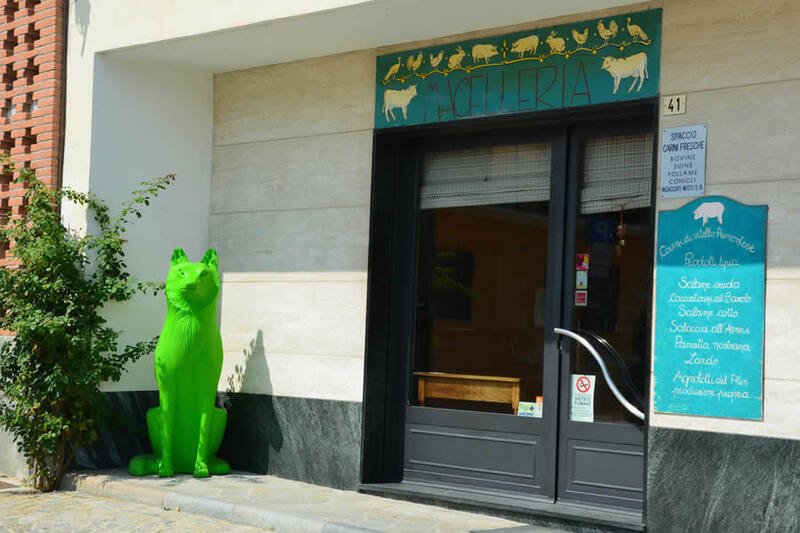 What a memory I have of that night… the horse that won was paraded up and down the narrow streets of his contrada or neighborhood. Long tables were set up going the length of the lane and tablecloths marked with the motif of that particular contrada were unrolled. In minutes at least a hundred people of all ages, from infants to great grandmothers were seated, ready to enjoy the block party. All of this at 10 o’clock at night. It was beautiful! Dear Claudine, thank you for your kind words! I do hope that we’ll again be able to share a lovely bottle of wine together. Indeed, I did not get your SMS, but I suspect that is because I now have a new Maltese mobile number. I wrote you an email message last night, as I’m sorry to hear that things may not be well with precious Annibale. Hugs to you and the entire family, and we shall talk soon. I live in Veneto, northern Italy, so this post really makes me proud and happy. Beautiful and interesting trip ! ! Angela, that’s lovely to hear – grazie mille! 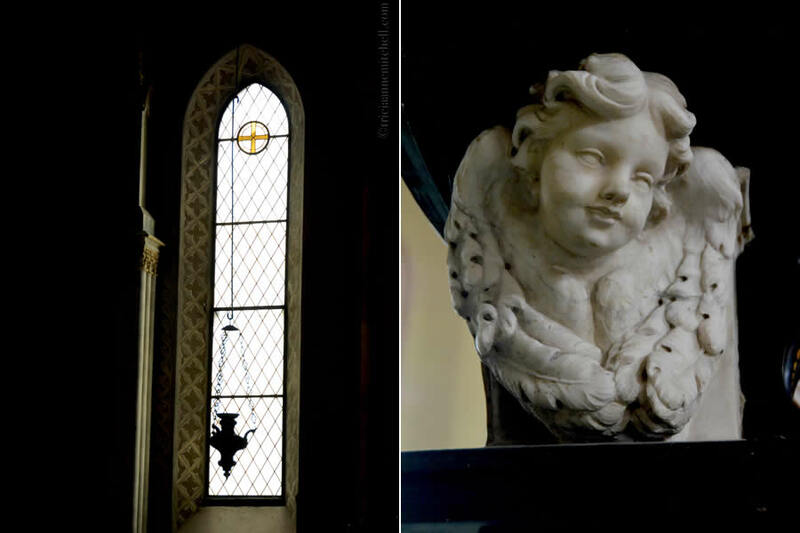 My husband and I spent some gorgeous spring days in the Veneto with Verona, Venice, Treviso, Padova and Valpolicella as some of the highlights. Of course, enjoying some Amarone factored in there too. 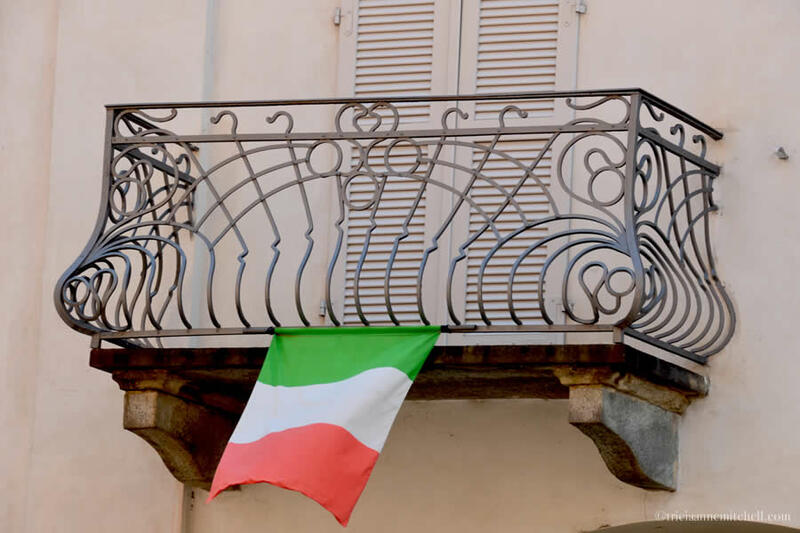 In what part of Veneto do you call home? I live in Treviso ! Wow, it’s amazing to hear that ! Wow, very informative and extensive post… beautiful photos… really enjoyed this journey! Roslyn, thank you for the nice feedback! 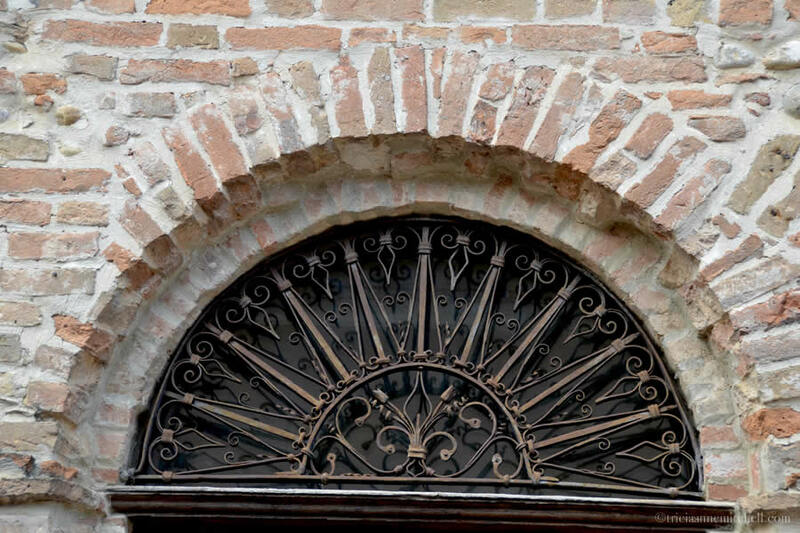 Given your appreciation for art history & architecture, I suspect you’d like this part of Italy. Have you been to Northern Italy? It must have been awesome to drink that kind of wine right at the source. Thank you for sharing your experience and your beautiful pictures. I’ve never tasted either one but I think I would like the Barolo better because it’s a big wine (big alcohol and big flavor). Tutto bello. Tutto bello. Hi Tricia: it may be who knows when before I can send you any recipes … Winter is arriving and with it pretty bad arthritis. And the years weigh heavily in Winter. I’ll get back in touch later. But you travel right there in the middle of it… so recipes can follow your every step. Ciao, V.
Vera, please don’t feel pressured at all to share the recipes; it’s just quite nice to hear your wonderful insight into life in the region! We’re actually not in Italy now, since we’ve moved to Malta for Shawn’s studies. With a few airlines and ferries linking the two countries, we’re looking forward to getting up that way and explore some more. Wish you a relaxing weekend. Here’s hoping it will be a gentle winter for you, Vera. Thank you. Enjoy life while you are young and strong. I did in my days long ago. Ah, Vera. Thank you for the important reminder about savoring each day. Sending you a big hug! Really good pictures, you’ve tempted me to make a visit when I go to Italy next summer! Ella, Piemonte is a worthwhile addition, so I’m glad to hear it! What other parts of the country will you be visiting? Randall, I always appreciate your thoughtful comments, especially here how you’ve drawn parallels between winemaking, work, and life itself. Shawn and I have been fortunate to have explored a fair number of wineries around the world, and each time, I’m struck by what an art and a science winemaking is. Enjoy what remains of your Tuesday, since you’re a few hours ahead. Thanks again for sharing your thoughts.